Despite a backdrop of symbolic mislabelling, campaigns such as BDS seem to have formulated new horizons of civil and political practice (in opposition to the mere declamation) of human rights. 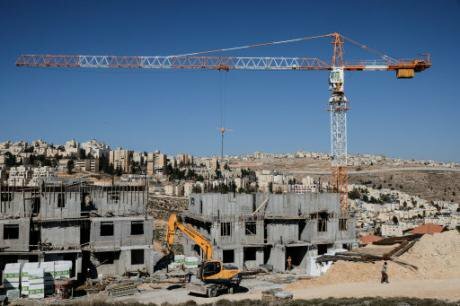 Housing construction is ongoing on the eastern slopes of Pisgat Zeev, in East Jerusalem, January 23,2017.Nir Alon Zuma Press/Press Agency. All right reserved. In recent weeks great attention and debate have followed the approval of the United Nations Security Council (UN SC) Resolution 2334, which reaffirmed with clarity the international illegality of the Israeli settlements in the Palestinian Territory occupied since 1967, including East Jerusalem. By contrast, an important statement signed – on the eve of the UN SC vote – by more than 200 lawyers and professors of International Law (among whom were John Dugard, Guy Goodwin-Gill, Kevin Jon Heller, Robert Kolb, Alain Pellet, Marco Sassòli and William Schabas) passed almost unnoticed. The document is directed against the measures adopted by several states to outlaw, prohibit, and in some cases to criminalize the “Boycott, Divestment and Sanctions” (BDS) campaign, which has for years engaged in the promotion of critical consumerism and economic non-cooperation of national and local institutions with Israeli companies and bodies involved in the occupation of the West Bank and in practices violating the human rights of Palestinians. One of the decisive passages of the statement declares: “Whether one approves of the aims or methods of BDS is not the issue. The issue is whether, in order to protect Israel, an exception is to be made to the freedom of expression that occupies a central and pivotal place among fundamental human rights. States that outlaw BDS are undermining this basic human right and threatening the credibility of human rights by exempting a particular state from the advocacy of peaceful measures designed to achieve its compliance with international law”. The problems reflected in the statement offer different profiles of interest. They intersect, in fact, between at least two critical levels of international legal discourse: on the one hand, the growing debate – even jurisprudence – related to the content and limits of the right to freedom of expression, as enshrined in human rights conventions; on the other hand, the growing discussions about horizons and contradictions of the human rights movements, about the decline of their emancipatory potential and the emergence of a “dark side” of these rights capable of altering, and even capsizing, their protective functions. The BDS campaign has recently achieved significant world impact. Campaign activists have greeted as success the sale of most of its activities in Israel by the British company of security services 'G4S', targeted for providing equipment and technologies for Israeli military prisons, checkpoints and settlements in the West Bank. Moreover, mobilizations for the boycott caused, according to many observers, the withdrawal of the French telecommunications giant Orange from activities in Israel (in particular after the publication of a report denouncing involvements of the company in the infrastructure of the Israeli occupation). In recent years this impact has induced the Israeli government to develop countering strategies that have raised concerns from various human rights organizations. In July 2011, the Knesset had approved the Bill for Prevention of Damage to the State of Israel Through Boycott, which, as a result of amendments that changed the provisions originally intended to create a criminal offence, sanctioned the promotion of boycott as a civil offence. The law sparked protests from several Israeli civil rights NGOs and pushed organizations like Human Rights Watch to assert that the bill "stifle[d] expression". The radicalization of the state-sponsored opposition to the BDS movement has since grown steadily, both in intensity and in the kind of arguments used. In March last year, for example, the Israeli intelligence Minister Yisrael Katz spoke openly of the need for “targeted civil eliminations” in relation to BDS movement leaders. This motivated Amnesty International to issue a tough statement, inferring from the expression of the Minister an allusion to targeted killings ( “the term alludes to “targeted assassinations” which is used to describe Israel's policy of targeting members of Palestinian armed groups”) and requesting the government of Israel to “stop intimidation against human rights defenders” and to “protect them from attack”. According to several national newspapers, in 2015 the Government of Israel (in support of what some commentators have called a «declaration of war» against the campaign) has allocated some 100 million NIS (26 million euros) for internal and international activities against the movement. Similarly, anti-BDS activities have been a major point in the covert lobbying campaign (and recruiting activities) linked to the Israeli Embassy in the United Kingdom, as recently unveiled by Al Jazeera, whose inquiry led to the resignation of a young Israeli diplomat. What level of “threat”, therefore, is posed by the BDS movement? Is it a threat for the State of Israel? Or does the campaign pose a threat only for its illegal occupation? It is significant, in this regard, the constitutive appeal of the campaign (available here), entitled: “Call for Boycott, Divestment and Sanctions against Israel Until it Complies with International Law and Universal Principles of Human Rights [emphasis added]”, signed in 2005 by over 170 Palestinian organizations of different inspirations. The call requests the implementation of divestment initiatives against Israel "similar to those applied to South Africa in the apartheid era" in order to "end the occupation and colonization of all Arab lands and dismantle the Wall", to "recognize the fundamental rights of the Arab-Palestinian citizens of Israel to full equality" and to promote "the rights of Palestinian refugees to return to their homes and properties as stipulated in UN resolution 194". This request, addressed significantly also to "conscientious Israelis for the sake of justice and genuine peace [emphasis added]", is openly qualified by the subscribers as a last resort tool, because – as they underline – "all forms of international intervention and peace-making have until now failed to convince or force Israel to comply with humanitarian law, to respect fundamental human rights and to end its occupation". In light of these explicit premises, arguments against BDS centred on accusations of racism and anti-Semitism frequently directed at the campaign by several commentators (see, between many, Hirsh) appear to lack persuasive force. On the contrary, it seems only fair to note that (no matter how subjectively one shares or disagrees with the arguments of the mentioned call) the “order of discourse” of international law, along with the keywords of self-determination, protection of human rights, non-discrimination and peace, constitute the main anchor of the campaign claims. This observation is particularly evident by virtue of the recent UN SC Resolution 2334, the content of which appears to highlight that the instances of the BDS movement reproduce, on the level of civic mobilization, numerous warnings and calls from international institutions against the long-lasting violations of international law reiterated in the Middle East conflict. The resolution, in fact, expresses strong condemnation of the construction and expansion of settlements and the related “confiscation of land, demolition of homes and displacement of Palestinian civilians” continued over the years. The Security Council, therefore, emphasized that the “the status quo is not sustainable”, as it is “steadily eroding the two-State solution and entrenching a one-State reality”. The Resolution also calls on third countries to “distinguish, in their relevant dealings, between the territory of the State of Israel and the territories occupied since 1967” and, above all, it reaffirms the obligation of Israel to freeze “all settlement activity” and to dismantle “all settlement outposts erected since March 2001”. Despite the dramatic reactions of the Israeli government, the remarks of the UN SC are predominantly a consolidation of orientations already followed several times before by different international institutions. For a brief reconstruction of the international legal issues of the Israeli occupation, it is worth recalling that the International Court of Justice (ICJ), in the well known Advisory Opinion on the Legal Consequences of the Construction of the Wall in the Occupied Palestinian Territory, authoritatively concluded on the international illegality of the Israeli settlements in the West Bank, stating that they violate the provisions of art. 49, par. 6 of the 1949 Fourth Geneva Convention, prohibiting an occupying power from “transfer parts of its own civilian population into parts of its own civilian population into the territory it occupies”. It is important to note that this prohibition, among the sources of international humanitarian law, holds particular force, as it is: 1) considered of customary rank and 2) qualified as a grave breach of the Conventions protection system by art. 85(4)(a) of their 1977 First Additional Protocol. The article has then been used as a model in the drafting of the war crimes offenses of the Rome Statute of the International Criminal Court, which, in fact, codifies the conduct in question in its art. 8(2)(b)(viii). For these reasons, the Resolution recalls that the policy of Israeli settlements “has no legal validity” and constitutes a “flagrant violation” of the Fourth Geneva Convention (reiterating the assertions of Resolutions 446 and 452 of 1979, and of the ICJ itself in the mentioned Advisory Opinion, see par. 120). Even the Fourth Hague Convention of 1907 dictates prescriptions relevant for the situation at issue. In the Regulations on the Laws and Customs of War on Land annexed to the Convention, in fact, art. 55 states that “The occupying State shall be regarded only as administrator and usufructuary [emphasis added] of public buildings, real estate, forests, and agricultural estates belonging to the hostile State, and situated in the occupied country”. It is also provided that the capital of these properties must be safeguarded, and they should be administered in compliance with the rules of the usufruct. Clearly the law of armed conflict is no longer that of 1907, but according to several recent reconstructions, dedicated specifically to the law of occupation, there are only two conditions (developing from the mentioned article) that justify the exercise of economic activities in occupied territory by the occupying power, namely: 1) the presence of imperative reasons of military necessity and 2) the benefit to the population under occupation (v.among others, Arahi Takahashi, p.169). At the domestic level, Israeli courts have made reference to these conditions in different cases (see the Israel High Court of Justice in Beth El [Ayub et al. v. Minister of Defense et al., HCJ 610/78] and Elon Moreh and Cooperative Society [ Duweikat et al. v. Government of Israel et al., HCJ 390/79]), while no acknowledgement of their compulsoriness has come from the Government. On the contrary, the Knesset has discussed in recent weeks the controversial Regulations Bill that, if passed, would legalize retroactively the situation of thousands of houses built in violation of the above-mentioned principles and insisting on private Palestinian properties subject to illegal expropriations (as underlined by Ronen and Shani). Effects of the Israeli occupation also collide with several principles of the United Nations Charter. The right to self determination of the Palestinian people, repeatedly recognized internationally (see again the ICJ Advisory Opinion, cit., par.149), is clearly obstructed and eroded by the territorial atomization due to the continuing growth and multiplication of the settlements themselves (see, among others, Ben-Naftali, Gross e Michaeli). Even in terms of human rights violations, the use of concepts such as ‘apartheid’ or ‘segregation’ cannot be reduced to a mere activists' claim, in particular if one confronts the definitional elements of the two phenomena provided by the Convention for the Suppression and Punishment of the Crime of Apartheid of 1973 and the Convention on the Elimination of All Forms of Racial Discrimination of 1965, as numerous and distinguished jurists have done, sharing – in many cases – the opinion that "there are indeed strong grounds to conclude that a system of apartheid has developed in the occupied Palestinian territory" (Dugard e Reynolds, p. 912). 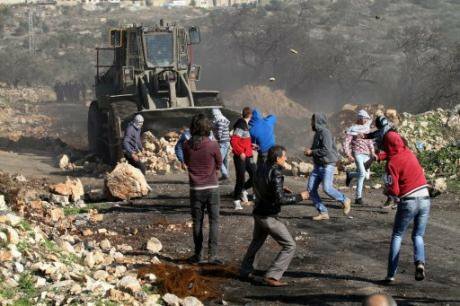 A protest against the expanding of Jewish settlements in Kufr Qadoom village near the West Bank city of Nablus, Jan. 20, 2017. Xinhua SIPA USA/Press Association. All rights reserved. Considering all these legal issues, scholars have sustained, even more categorically than the BDS campaign, the existence not only of a faculty, but of an international obligation upon third states not to trade products from Israeli settlements in occupied Palestinian territory. (see Moerenhout here and here; contra, see Kantorovich and Crawford). One of the most discussed aspects of this debate is the existence, or not, of self-executing obligations of non-recognition from third States with respect to occupations and annexations violating the prohibition of aggression and the principle of territorial integrity of States. It is legitimate, in this regard, to draw a comparison with the annexation of Crimea by the Russian Federation. The Council of Europe responded to the annexation prohibiting imports from the region and from Sevastopol (see the Council conclusions of March 2014). The issue remains controversial (see Milano). However, the presence of such an open and challenging legal debate renders the ‘lawfare’ exercised against the BDS movement by states particularly striking. Significantly, the fact that the claims of the campaign clearly echo International Conventions, UN General Assembly and Security Council resolutions, as well as relevant decisions of the International Court of Justice, not only failed to stop – in the political debate – the mislabelling of this peaceful form of mobilization (intended to influence the political and military decisions of a government) as an incitement to racial discrimination on an ethnic or national basis, but failed even to discourage legislative initiatives seeking to impose this debatable vision juris et de jure. - In the United States, the measures at issue were taken mostly in the form of laws adopted by Federal States to ban commercial collaborations with, or to exclude from public procurements, the companies participating in boycotts against States not affected by embargoes or sanctions. Particularly explicit, among others, the legislation adopted by Illinois, which prompted the drafting of a blacklist of companies “engaging in actions that are politically motivated and are intended to penalize, inflict economic harm on, or otherwise limit commercial relations with the State of Israel or companies based in the State of Israel or in territories controlled by the State of Israel”. This legislation banned the State pension fund from contracting or investing with those companies (see the amendment to the Pension Code here). Similar provisions are being considered or have been adopted by several other States (such as the South Carolina Bill H.3583, commented on the Harvard Law Review). - In February, the Canadian Parliament approved a motion rejecting the campaign, which – according to the text – “promotes the demonization and delegitimization of the State of Israel”, and calling on the government to "condemn any attempt by organizations, groups or individual Canadians to promote the BDS movement". There have also been voices in support of the criminalization of the boycott as a form of hate speech. - In the same month, the United Kingdom Government, with the declared intention of countering BDS, passed a controversial Policy Note regarding public procurements, which essentially required local institutions, public bodies and executive agencies to cut ties with companies adhering to boycott campaigns, unless already “formal legal sanctions, embargoes and restrictions have been put in place by the UK Government”. On the other hand, in June, the High Court of Justice dismissed the claims of Jewish Human Rights Watch against the motions of three City Councils (Leicester, Swansea and Gwynedd) endorsing the boycott on goods produced in illegal settlements in the West Bank. - In France the legal and jurisprudential scenario is particularly relevant to this discussion. The home of Charlie Hebdo is the only state besides Israel itself that criminalizes citizens propagating the boycott of Israeli products. Art. 225-2 § 2 of the French Criminal Code criminalizes those who, on the basis of discrimination or of incitement to discriminate on grounds of the origin or membership of a national group, “obstructs the exercise of any economic activity”, with a penalty up to three years’ imprisonment. One of the cases discussed by French legal scholars, however, emerged from indictments based on different provisions. In October 2015, the Criminal Chamber of the Cour de Cassation confirmed the sentence imposed and the indictment issued by the Colmar Cour d'Appel against a group of activists for distributing leaflets calling for the boycott of Israeli products in a supermarket. The judges stated that in this case the Court of Appeal had rightly extended the applicability of Art. 24 § 8 of the Loi sur le liberté de la presse, which punishes public incitement to discrimination. The Court of Cassation also asserted that the Colmar Court had correctly excluded the actions at issue from the scope of application of the right to freedom of expression laid down in art.10 of the European Convention on Human Rights (ECHR). According to the judgement, the defendants had incited discrimination, urging customers not to buy goods because of their national origins, justifying the compression of freedom as necessary by virtue of other people's rights, as provided by art. 10 § 2 of the ECHR (Cass. Crim., 20 octobre 2015, No. 1480021, av. here). The reasoning of Court of Cassation has been subject to much criticism (see, among others, Médard) for undermining the distinction occurring between products and producers, and for failing to clarify to what extent the “incitement” to boycott was characterized by racist or xenophobic motives. - Even in Italy a draft law to stifle the BDS movement has been deposited for examination at the Senate. The draft includes new amendments to the Italian law ratifying the Convention on the Elimination of All Forms of Racial Discrimination in order to punish with imprisonment from six months to four years those who “obstruct the exercise of any economic activity” on the basis of discrimination against physical or juridical persons, on the grounds of “membership of national, ethnic, racial, religious, state or territorial groups”. The draft also proposes to punish with imprisonment up to six years those who direct or promote movements with these purposes. Similar instances of criminalization reveal serious dangers. Particularly at odds with the arguments behind the adoption of these laws (and the rhetoric of the forces advocating for them) is the risk of incriminating the same groups they are intended to protect from discrimination: which would be the outcome of these penal norms in the numerous cases of staunch Zionist commentators, Jewish organizations, and Holocaust survivors endorsing the boycott in recent years. If inviting to boycott Israeli products, as these laws assume, equates with incitement to racial discrimination or anti-Semitism, it may well be possible to indict these commentators for the same offenses contested in the case of BDS activists and leaders. The paradoxes of these legal initiatives, however, are more general and complex. The laws and draft laws mentioned previously indirectly utilize the Convention on the Elimination of All Forms of Racial Discrimination as a source to criminalize citizens actively advocating for the respect of the rights therein. The legal tools to be amended in order to introduce these penal norms, in fact, are precisely the national laws ratifying the Convention. This therefore precisely reveals a short circuiting of international legal discourse: the possibility of outlawing and suppressing, at state level, not the violations of international law, but rather the struggles for its affirmation and for international legality. One would be hard-pressed to find a more emblematic illustration of the “dark side” of human rights, as revealed by the growth of repressive optimisms too often assuming criminal law as the main instrument to guarantee the effectiveness of these rights. This over-reliance on penal sanctions, in fact, usually ignores the dangers arising from the uncontrolled expansion of criminal systems, in particular when combined with the growth of criminal policies inclined to pursue merely symbolic functions. A tendency, in other words, leading to penal populism and, consequently, jeopardizing human rights themselves. Human rights tend to the universal, but universalism brings with it the impulse for the de-politicization and the removal of the adversarial dynamics from which human rights have arisen. Universalism, in fact, abstracts the human within the Conventions from the field of tension in which, instead, men exist and operate as historical and political subjects. The more one tries to expand the universalist implications of these rights and their supposed neutrality, the more generalized the tendency to transform the human rights language becomes, in a kaleidoscope of translations and claims intended to universalize particular interests. Within this tendency, depending on who in a determined context acts as “translator”, the concepts of abuse, perpetrator and victim become dramatically interchangeable (see Gordon and Perugini). Can collective subjects, in opposition to transnational dominant powers, restore a progressive historical function to these rights? Concepts such as “endtimes” or “twilight” of human rights and of their emancipatory potential are becoming a topos of the human rights debate (see, in particular, Hopgood and Posner). Particularly significant, within this ambit, is the point of view of those who underline that, in the age of neoliberalism, what escapes the possibilities of the human rights discourse – neutralizing its performativity – is to assume equality as a crucial factor of transformation of the reality. “Even perfectly realized – as has been efficaciously noted – human rights are compatible with radical inequality” (see Moyn here and, more extensively, here). It seems, however, that the short circuit triggered by campaigns such as BDS testifies to a possibility. It is, on the one hand, surely possible to agree with the opinion of the jurists subscribing the statement quoted at the beginning of this argument, that BDS is a campaign exercising the rights to freedom of expression and political dissent and that, as such, it must be protected even by those who do not share its claims. But, on the other hand, this point of view does not catch a crucial aspect: campaigns such as BDS have the distinctive characteristic of going beyond the individual dimension of human rights and their mere expression. This transforms these rights into a platform of collective action that, even using the same “idiom of the hegemonic”, has shown itself able to organize a confrontational pressure of civil society against the radical inequalities in the enjoyment of human rights, as well as against the discriminatory selectivity of the mechanisms to sanction their serious violation on the basis of power relations. From this point of view, the critical issues mentioned bring to mind the views of jurists attempting to actualize the lessons of Antonio Gramsci and his theory of hegemony, by projecting them into the international arena. Some of these jurists, referring to the Prison Notebooks of the Italian intellectual, have underlined the tactical and strategic centrality of movements for critical consumerism in the global struggle for effectiveness and equal enjoyment of human rights. Within a perspective intended to show the transformative potential of a theory of International Law “from below”, these scholars have substantially argued that, as in Gramscian theory, even in the international arena transnational dominant powers are able to rule over their social adversaries also because they obtain the consensus of their social allies. For this reason, international lawyers should look at states “as a plural and fragmented terrain of contestation rather than as a monolith”. Adopting this view would induce the acknowledgement that, as shown by the case at issue, “international law and institutions provide important arenas for social movement action”, with the consequence of “expanding the space of transformative politics” based on the nexus between freedom, social justice and peace (see Rajagopal, pp. 19 e 23). After all, the possibility of contending their outer limits is one of the constitutive elements of the historical process of codification of human rights. In contradistinction to recent attention directed at euro-centrism and the colonial mindset behind the rise of modern international law, many scholars are illustrating how the importance of the opposite Weltanschauung of decolonization has been significantly underestimated, and are striving to demonstrate the crucial endeavours of politicians, jurists and diplomats of the Global South in setting the human rights agenda between 1948 and the 1960's (see the important work of Jensen here, and more synthetically here). In conclusion, it cannot only be argued that the right to campaign for boycotts to pursue the affirmation of basic human rights should be protected by every jurist, legislator and citizen sensible to the Rule of Law but, more profoundly, it seems that campaigns such as BDS seem to have formulated new horizons of civil and political practice (in opposition to declamation) of human rights; horizons that can be useful for those who intend to let these rights “walk”, in their dialectic relation with the international powers, “upon their feet rather than on their head”. This article originally appeared in Italian on the blog of the Italian Society of International Law.